Revelation 1:1 "The Revelation of Jesus Christ, which God gave Him to show to His bond-servants, the things which must soon take place; and He sent and communicated it by His angel to His bond-servant John"
In the 66 books composing the Bible, we discover some 200 or so names that are attributable to the Son of God. Some of those names point to the Son as He was in His pre-incarnate, pre-eternal existence (for example, "The Word" in John 1:1, 14). Other names speak of the Second Person of the Trinity as He is in His co-equality with the Father and the Spirit (i.e. "the Son", "the only-begotten Son"). Still other titles are ascribed to the Son following His incarnation (i.e. "Jesus"). The names of Christ bridge to His people a true knowledge of His character and dual-natures as God and man. 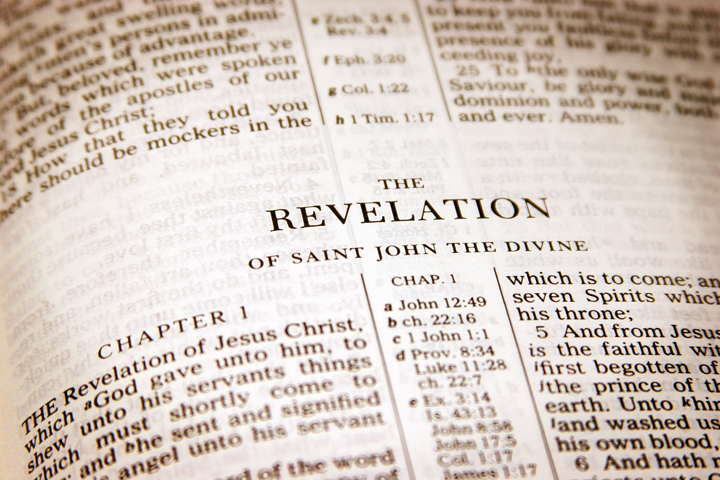 Of those 200 or so names,titles or descriptions, nearly 40 of them are found in Revelation 1. To say that the Book of Revelation is an incredible book is a monumental understatement. The Apostle John, the author of the book of Revelation or as it is also known by its Greek title, "The Apocalypse", is provided a revelation of the post-ascended Jesus that most profound, personal and powerful. In today's post, I want us to sketch out the five ways we encounter Jesus Christ in Revelation 1. As much as the Book of Revelation focuses upon Jesus Christ's Second Coming, reference is often made to the accomplishments of His first coming. For example, we are reminded in Revelation 1:5 that Jesus is the resurrected "firstborn" from the dead. To say Christ is the "firstborn" refers to Him as "heir of all things" (Colossians 1:18). This particular title: "firstborn", expresses how Christ ascended into Heaven to His coronation as King. Two senses convey the meaning of this title. First, Christ began His Kingly reign over His church. Second, He spiritually inaugurated what will become His physical, earthly reign upon His second coming. Hence, as mentioned already, the term "firstborn" suggests that Christ is the rightful heir of all things. This title entails Christ's true deity and excludes any notion of He being some sort of "highest created being" as asserted by groups such as the Jehovah Witnesses. Therefore, Jesus is the Savior who is heir of all things. As Savior, Jesus Christ is never disconnected from what He endured on the cross. In Revelation 1:7, mention is made of how the tribes of the earth will see Him who was "pierced". John references the Hebrew Old Testament over 200 times in His apocalypse. The term "pierced" is an echo back to Zechariah 12:10. Why is it that the Holy Ghost saw fit to include this word "pierced"? To remind readers that, even in His now glorified humanity, Jesus still bears the marks of nail prints in His hands and feet. Jesus Himself testifies in Revelation 1:18 that He is the Living One who was once dead but Who is alive forever more. "He is so much man as to not be God, and yet so much God as to not be man. This same Jesus is, one and at the same time, truly God and truly man." "Thus says the Lord, the King of Israel and his Redeemer the Lord of hosts, 'I am the First and the Last; besides me there is no god." God is, by definition, the first and the last, the only God. Jesus Christ is the "Alpha and Omega", the first and the last. Therefore, Jesus Christ is God. Theologians have used the term "session" to describe what Christ is currently doing in His ministry to His people and over History. This "session" refers to the three particular roles or offices He occupies: prophet, priest and king. In scripture we see Jesus occupying these three offices. First, He is our King, who right now rules over His church in Heaven and Who is coming back to set up His throne here on earth (Colossians 1:15-20; Revelation 1:5). Secondly, Jesus Christ is the Believer's High Priest, representing us to God the Father (1 John 2:1-2; Revelation 1:7). Though we have already shown Jesus as the King, the title "Ruler of the Kings of the Earth" is worth mentioning (Revelation 1:5). In the study of Bible prophecy, scholars use a little phrase: "already/not yet", to explain prophecies wherein an event has begun but has not yet reached its full manifestation. Christ is ruling right now in Heaven over His Kingdom in a spiritual sense and over the church in particular manner. In some sense, He is already reigning in Kingly authority over the Kings of the earth. However, He has not yet fully manifested this reign. Christ's kingdom won't manifest fully until He returns as revealed in Revelation 19-20 to set up His 1,000 year Millennial Kingdom. The Apostle Paul writes in both Philippians 2 and 1 Timothy 3:15-16 that in essence, Jesus Christ is "God in Human Flesh". Jesus Christ is the Prophet Who is the full-orbed revelation of the invisible God (Hebrews 1:1-2). Jesus Christ as God in Human Flesh shares in the same Undivided nature with the Father. 1 Corinthians 8:6 for example tells us that the Father is the One "from whom all things exists" and the Son at the same time is the One "through Whom all things consist". In today's post, we explored five ways we encounter Jesus Christ in Revelation 1. We noted firstly, Jesus Christ the Savior. Second, Jesus Christ in His Deity. Thirdly, Jesus Christ the Priestly Mediator. Fourthly, Jesus Christ the King. Fifthly and finally, Jesus Christ the Prophet. Meditating on these five main points can aid in meditating on John's opening vision in his glorious Apocalypse.